Inspired by true events, the series follows two great men of the 20th Century and real-life friends - Harry Houdini, master magician, escape artist and paranormal debunker; and Arthur Cohen Doyle prolific writer, creator of "Sherlock Holmes" and paranormal aficionado. They grudgingly join forces with New Scotland Yard to investigate unsolved, inexplicable and possibly supernatural crimes, alongside the first female Constable of the London Metropolitan Police Force, Adelaide Statton. 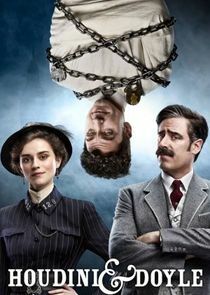 In the series, Houdini, Doyle and Stratton are tasked with the cases that nobody else can solve. It challenges their sense of what is real and what is not. Houdini is a skeptic, while Doyle believes in the unseen. Their diverse viewpoints make solving crime a challenge and often Stratton is put in the middle. The trio will take on cases that involve vampires, ghosts, monsters and poltergeists... or are they a ruse to conceal murder?